Tile of fritware, hexagonal, painted in blue and turquoise on a white ground, with a six-pointed star filled in with Chinese cloud ornament, surrounding a central rosette and symmetrically arranged. Between the points of the star are halves of floral devices. Nous avons l’honneur de vous informer que nous serions disposés à vendre la très interressante [sic] collection de faïences orientales rapportée en 1865 par notre père, lors de ses voyages en Asie. 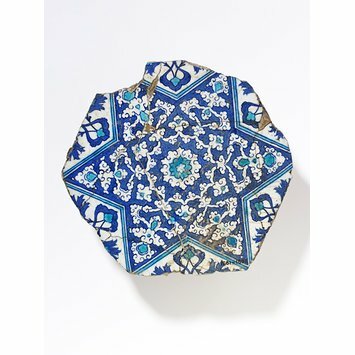 / Cette collection comprend une soixantaine de pieces [sic] provenant pour un grand part de la Mosquée de Yechil Djami, du tombeau de Mohammed 1er à Brousse (Asie Mineure), XVème siècle. The price was 15,000 francs. Officials in South Kensington were already aware of the collection, having been shown a photograph of it by a London dealer, J. Sasson, and two representatives from the Museum visited Paris in November to view the tiles. It was agreed to make an offer of 7,500 francs, which was accepted. 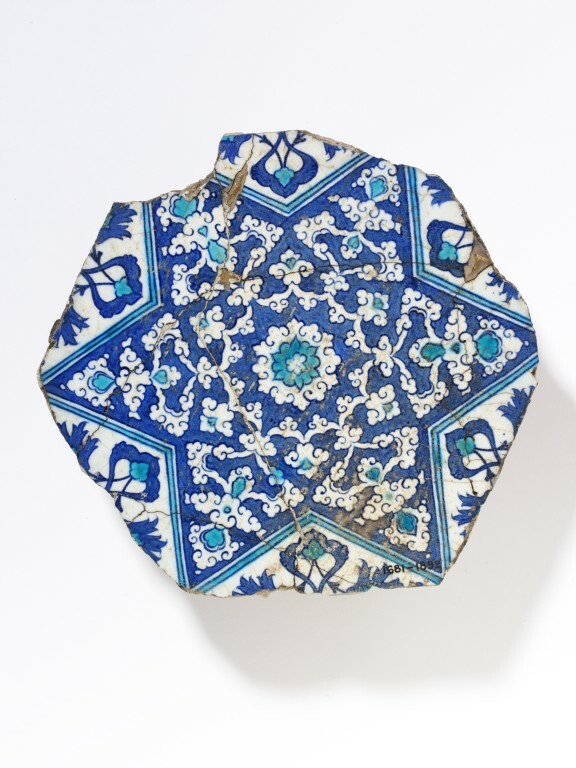 Four of the tiles, accessioned as 1679 to 1681-1892, are now identified as coming from the Çinili Hamam in the Zeyrek district of Istanbul.